The Malthusian theory fully applies to countries like India. India is, at present, in that unenviable positio which Malthus feared. We have the highest birh-rate and the highest death-rate in the world. Grinding poverty, ever-recurring epidemics, famine, communal quarrels are the order of the day. We are deficient in food supply. Our standard of living is incredibly low. Who can say that , Ialthus was not a true prophet. if not for his country. at any rate for countries like India and China. Modem economists have rejected the Malthusian theory of maximum population which, if exceeded, will spell misery in the country. Instead of the maximum population, the modem economists have substituted the idea of the optimum population. By optimum population is meant the ideal number of the population that a country should have, considering its resources. 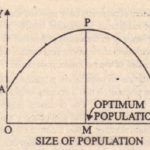 The optimum means the best and the most desirable size of a country’s population. It is the right number. When a country’s population is neither too big nor small, but just that much which the country ought to have, it is called the optimum population. 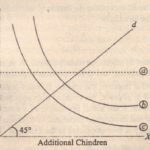 Given a certain amount of resources, state of technical knowledge and a certain stock of capital, there will be a definite size of the population at which the real income of goods and services per will be the highest. This the optimum size. The optimum number can. therefore. he defined as the one at which per capital income is the highest. Per income will diminish; standard of living will fall; war famine and disease will be constant companions of such a people. These are the symptoms of over-population. Capital formation will be hampered and economic development will be slowed down. The dangers of over-population, however, can be avoided by increasing the supply of capital. There is a race between productivity and population. If productivity wins the race, the danger is averted. To be Optimum, Let us suppose that natural resources, stock of capital equipment and state of technology remain fixed in a country. Now assume that population which was initially very small relative to these other resources begins to increase. With the increase in population, labor force of the country will also increase. As more and more labor-is combined with the fixed amounts of these other resources, output per or real income per head will rise. Why ? This is because the increase in the quantity of labor will make possible greater degree of specialization and more efficient use of natural and capital resources of the country. With a very small population or labor force, there was a limited scope for specialization, for each worker was required to do all sorts of jobs. But as population and, therefore, the quantity of lab our increases, specialization becomes possible. Each man then need not do all the jobs or make all parts of a good. Everybody can concentrate on the job for which he is best suited. Division of lab our among the different workers, which is made possible by the increase in population, greatly increases the efficiency arc productivity of labor. At the optimum. For all these reasons, output per ca pita will rise for a time as population increases. As the population continuous to increase. a point will finally be reached when capital and natural resources are fully utilized and, therefore. output per capital is the highest. 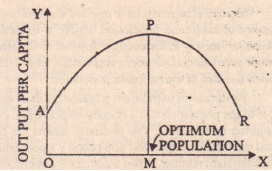 The level of population at which per capital output or real income is the maximum is called the optimum population. If population still goes on increasing, that is. crosses the optimum point, output per capital will start declining. The country would then become over-populated. in agriculture. add nothing to production. In this figure, the size of the population is measured on X-axis and output per on Y-axis. It is evident from the figure that. in the beginning, as population increases, output per capita also increases. Output per goes on increasing with every increase in population till OM population is reached. At OM level of population, the output per MP is the highest. If population now increases beyond OM, output per capita falls. Therefore. OM is the optimum population. If the population of the country is less than OM, it will be under-populated and if the population is more than OM. it will be a case of over-population. The theory ignores political, social. strategic and other aspects of the population problem and considers only the economic aspect. For instance, a small population may be advocated on economic grounds but it will be dangerous from the point of view of defence. Adam Smith rightly said.Defence is better than opulence.”The concept of the optimum population is only of theoretical interest. Actually, it is not easy to attain the optimum size by reducing population in the case of over-population and increas in it in the case of under-population. 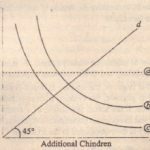 Family planning, whether aiming at reducing population or increasing it, is a long drawn fair extending over several generations. Human are more influenced by culture and traditions by rigid government regulation.